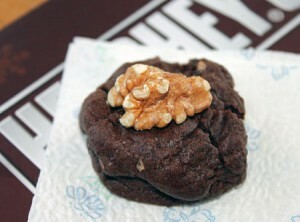 Thick, chewy, chocolate cookies with a soft inside and firm shell. Cream together margarine (or room temperature butter) and sugar. Stir in syrup, vanilla and eggs. Sift or just stir together flour, baking powder and salt. Add to sugar mixture, mixing well. Add melted chocolate and nuts. Stir until mixed. Drop by heaping teaspoons onto parchment lined baking sheet. Bake for 10 to 12 minutes. Makes about 4 dozen cookies. The dough keeps well in the refrigerator. I baked some of the cookies right away, then shaped the rest of the dough into balls and put them in the refrigerator for a few hours. The cookies which I shaped and chilled definitely had a nicer shape.